Do you need help building membership? Do your staff and members want to learn about cutting costs while growing your network? Are you using effective website tools and links as part of your grassroots program? Today on Capitol Hill there are more advocates--professional and grassroots--than at any other time in the nation's history. Their increasing numbers, and the many new ways technology allows messages to be delivered to Members of Congress, are contributing to an information overload on the Hill. The recipients of these messages are staff members whose average age and experience continues to decline. This program can be designed as Grassroots Advocacy & Coalition Building. 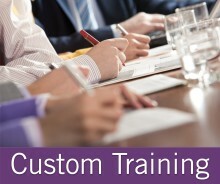 All custom training is tailored for each organization and audience. Topics from this program can be combined with topics from our other programs and with topics from your existing training programs. See our Sample Agendas page for sample agendas available by request. Audience Level This program will benefit organizations that want to better manage their PAC. Audience Size This program is most effective for between 10 and 35 attendees. Previous Clients Our selected client list includes clients who have purchased custom training, sent staff to our public programs and who have purchased our publications. Course Materials Course manual included. Usually requires 1/2 to 1 day. This program is usually held in Washington, DC. It can be presented anywhere in the United States. Fee The fee for this program depends on the location, number of attendees, length, and training materials. Call us for details, or complete our custom program information request for more information. What is included in the fee? TheCapitol.Net tailors each program to meet your training and educational objectives. Before we issue a cost proposal, we will work with you to tailor a program to meet your training objectives. The program fee includes pre-program development and design, materials for your internal marketing and promotion, all course materials, and faculty chosen for your topic and your audience at the time and location you choose. Our custom program clients provide the classroom/meeting space, all audio visual equipment, any food and beverages, all registration functions, and travel arrangements for attendees. When the program is held outside the Washington, DC metro area, travel arrangements for faculty can be made by the client or by us. We can also provide meeting space, audio visual equipment, food and beverage, registration, and travel arrangements, though this affects program cost. FAQs See FAQs About Our Custom On-Site Training. Payment Payment methods we accept for custom training include checks and EFT/ACH. About Us TheCapitol.Net, Inc., is a non-partisan small business, and a Virginia corporation. We are registered with CCR / SAM. See our Capability Statement and our About Us page for more details. Complete our online custom program information request. Non-Partisan TheCapitol.Net is a non-partisan firm, and the opinions of its faculty, authors, clients and the owners and operators of its vendors are their own and do not represent those of TheCapitol.Net. Our team of experts have at least 10 years of current experience with various aspects of PAC management, including the use of current technologies.